For other uses, see Bastille (disambiguation). Line 1 platforms before the aforementioned line's automation. Bastille is a station on lines 1, 5 and 8 of the Paris Métro. It is located near the Bastille Square and former location of the Bastille and remains of the Bastille can be seen on line 5. The platforms for line 1 are situated below road level but above the Bassin of the Arsenal and Canal Saint Martin in a short open-air segment. The western end of the line 1 platforms have the sharpest curve used by passenger trains on the Métro, with a radius of only 40 metres (131 ft). The line 1 platforms, at 123 metres (404 ft) long, are significantly longer than the average Métro platform length. The line 1 station opened as part of the first stage of the line between Porte de Vincennes and Porte Maillot on 19 July 1900. The line 5 platforms were opened on 17 December 1906 when the line was extended from Gare de Lyon to Lancry (now known as Jacques Bonsergent). The line 8 platforms were opened on 5 May 1931 when the line was extended from Richelieu – Drouot to Porte de Charenton. The platforms on line 1 were decorated in 1989 to celebrate the bicentenary of the French Revolution. Promenade Plantée, a 4.5-kilometre long (2.8 mi) elevated garden along the abandoned railway which led to the former Gare de La Bastille railway station. ^ Hardy, B. Paris Metro Handbook, 3rd edition, Capital Transport Publishing, 1999. 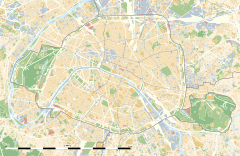 Wikimedia Commons has media related to Bastille (Paris Metro). Roland, Gérard (2003). Stations de métro. D’Abbesses à Wagram. Éditions Bonneton. This page was last edited on 13 January 2019, at 02:50 (UTC).